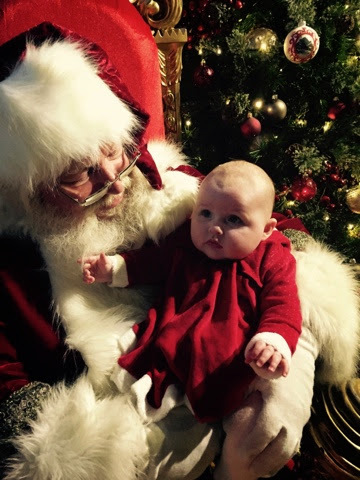 Baby Pebbles: Penelope's First Visit With Santa! I know she doesn't understand what on earth Christmas is all about she's far too young. 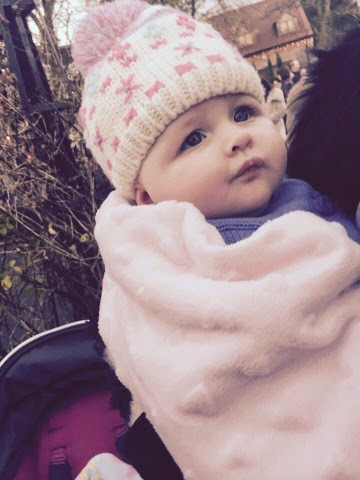 One day she will be old enough! I want her to be able to look back on pictures and videos we captured so she can see herself as a tiny little girl embracing every moment of it! 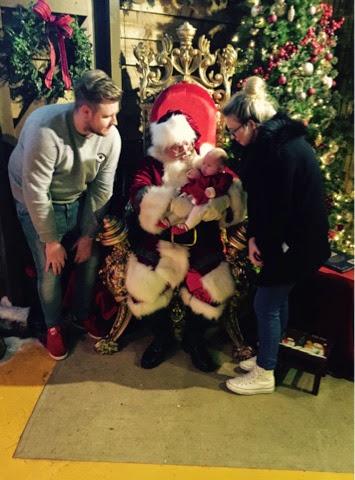 We went to see Santa arrive at Frosts garden centre. He came down with snow fairies while snow fell all over us, just magical. She looked on watching him 'walk' down! His reindeer must have been resting?! I was obviously far more excited than she was, totally naive and oblivious to all the good fun around her. A few days later we actually went to visit him. I had butterflies in my stomach and even refused the mince pies on offer. Who knew I would be such an emotional wreck....But heck my daughter was about to meet Santa! THE Santa. A man she will grow to love and be so excited to see every year that she'll squeal her little heart out. A man she will admire, a man she will put all her hope into by asking him for what she would most like for Christmas, wishing that he will get it for her. It felt like the first of many happy years to come. Very over whelming. Here is Penny with Santa! I'm so excited about meeting Santa with Jasmine next week now.